Summer makes the world a sweltering wasteland, so why not hold up in air-conditioned comfort with the new anime season. 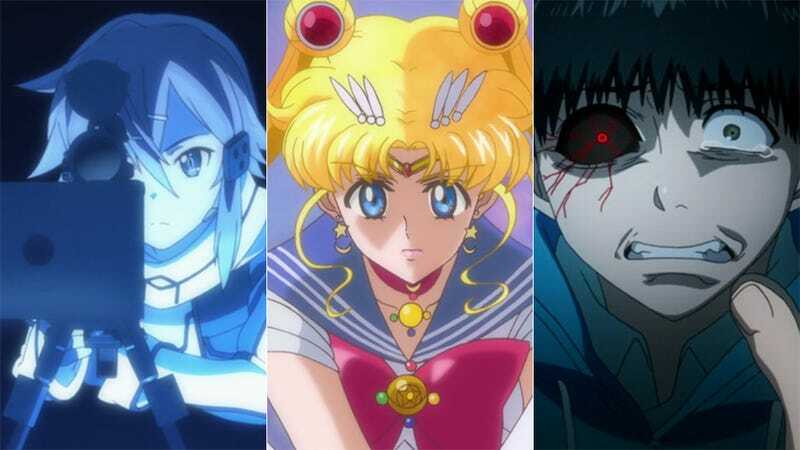 Of course, with 44 new anime in the pipeline, how do you know which ones to watch? Check out the trailers and brief blurbs about each to see which of them catches your interest. What It’s About in One Sentence: Sequel to last summer’s Free!, this anime continues the adventures of a team of male high school swimmers who spend an inordinate amount of their time shirtless. If You Like Shirtless Anime Boys, Watch Free! What It’s About in One Sentence: Glasslip is a story centering around the life of a 17-year-old girl who dreams of becoming a glass artisan. What It’s About in One Sentence: When a girl who loves fairy tales meets a real-life fairy (read: foreigner), she is introduced to the world of traditional Japanese dance. What It’s About in One Sentence: The second season of a short-form anime about a group of girls whose hobby is mountaineering. What It’s About in One Sentence: The story of a young calligrapher who moves to a remote chain of islands and his interactions with the people he meets there. What It’s About in One Sentence: A boy joins his school’s newspaper club and finds himself writing the life advice column. What It’s About in One Sentence: A high school girl finds out the boy she likes is actually a famous shoujo manga author and so she becomes his assistant. What It’s About in One Sentence: After spending her middle school life ostracized for being too cute, a girl reinvents herself to be as unattractive as possible so that her friends won’t be jealous of her. What It’s About in One Sentence: A boy short on funds is forced to live in a small apartment, haunted by the ghost of a dead girl and surrounded by eccentric neighbors. What It’s About in One Sentence: One day, an otaku boy performs in a commercial where he cross-dresses as a girl, and one of the other actors falls in love with him at first sight—and that doesn't change when he finds out the otaku boy's true gender. What It’s About in One Sentence: In this short-form anime, when his parents steal his identity and rack up a massive debt, a boy finds that the only way to pay it off is to become the student council’s “dog”—and thus spend every day dressed as a girl. What It’s About in One Sentence: A short-form anime about the slapstick adventures of a second grader, his family, and his friends. What It’s About in One Sentence: A girl is forced to join her middle school’s survival game club and partake in all kinds of military training. What It’s About in One Sentence: The second season of a short-form anime about four girls in a manga club who do all sorts of crazy things when they aren't drawing manga. What It’s About in One Sentence: In a feudal Japan where the population is subjugated by music, a group of rockers rise up to free Japan from tyranny through the power of song. What It’s About in One Sentence: The story of an all-male idol group working hard to make it big. What It’s About in One Sentence: A normal high school girl and her friend end up becoming their town’s local idols. What It’s About in One Sentence: An elementary school girl grasps her chance to become an idol in a world of fashion, dance, and music. What It’s About in One Sentence: Using MikuMikuDance and motion capture technology, this anime about two aspiring idols will be broadcast live and animated on the fly. What It’s About in One Sentence: The adventures of a zombie girl (who is the personification of Japan’s northern island of Hokkaido) with a big appetite for Hokkaido’s famous foods. What It’s About in One Sentence: Loosely based on the Japanese fairy tale Momotaro, a swordswoman born from a peach, and her companions fight against the invading devil king and his armies. What It’s About in One Sentence: A witch must grant 666 wishes for a normal high school boy to undo her demotion to “apprentice”—however, what she doesn't know is that each wish granted shortens his lifespan. What It’s About in One Sentence: Five superpowered girls and their two talking cats battle the forces of evil. What It’s About in One Sentence: The second season of an alternate universe tale starring the characters of Fate/Stay Night as magical girls. What It’s About in One Sentence: In a fantasy world where only pure maidens can interact with the spirits, a boy finds he can do the same and thus heads to the spirit academy to become the first ever male student. What It’s About in One Sentence: In the midst of a long lasting civil war, a young soldier becomes the pilot of a new giant robot: the Argevollen. What It’s About in One Sentence: Set in a parallel universe, where the Apollo 17 astronauts found a hypergate to Mars on the moon in 1979, a war between Martian colonists and the earth begins. What It’s About in One Sentence: A short-form anime parody of the original Mobile Suit Gundam. What It’s About in One Sentence: In a world where Japan never privatized its railway system, a young man seeking an easy life joins the railway security force—only to be surrounded by oddball coworkers while facing off against violent extremists who want to privatize the railways. What It’s About in One Sentence: The third season of an anime retelling the real life civil war that unified Japan under the Shogun—only with pretty boys and over-the-top action. What It’s About in One Sentence: After moving to the Capital to make money for his impoverished village, a young man finds himself joining a group of assassins who intend to end the corruption in the government once and for all. What It’s About in One Sentence: A survivor of the VR death game Sword Art Online joins a VR online FPS to catch a murderer who is somehow shooting people in the game and causing them to die in real life. What It’s About in One Sentence: A young man lives a normal life, working at a junk shop, until the day he's forced to do battle in an online game. What It’s About in One Sentence: In a world where Tokyo has been devastated by a terrorist attack, two mysterious children carry out their heinous plan. What It’s About in One Sentence: After nearly being killed, a young man receives an organ transplant from a “ghoul”—a human-looking but flesh-eating creature—and becomes half-man, half-ghoul. What It’s About in One Sentence: An alternate version of Black Butler (that follows the manga from the point where the original anime diverged) which tells the story of a boy who sold his soul to a demon to get revenge for his parents’ murder. What It’s About in One Sentence: When a normal high school boy travels back in time, he must take the place of Oda Nobunaga and unify feudal Japan. What It’s About in One Sentence: The second season of a short-form anime that uses traditional Japanese cut-out animation to act out traditional folktales and urban legends surrounding the supernatural in Japan. What It’s About in One Sentence: A new anime adaptation of Persona 4 (this time focusing on the Vita version of the game with its various additions) where a group of teens discover a dangerous world inside the TV that someone is using to commit murder. What It’s About in One Sentence: The second season of an anime about a group of mutants who run a private detective agency. What It’s About in One Sentence: One day, a normal girl sees a penguin and some fish flying through the air and, after one of the fish touches her, she discovers she has the ability to phase through solid objects. What It’s About in One Sentence: The second season of a short-form anime where a young man, after finding that his missing brother has become the head of a detective agency and refuses to return home, decides to join him in solving mysteries. What It’s About in One Sentence: The second season of an anime about the “dandiest man in space,” his cat-like alien sidekick, and his robot. What It’s About in One Sentence: The exact same thing it was about before it got delayed during the spring season.